The holy month of Ramadan is observed by Muslims all over the world.It is the ninth month of the Islamic Lunar calendar.Its the month when the Holy Quran was revealed to the Prophet Muhammed. During this month the Muslims fast for the whole month from sunrise to sunset. The holy month of Ramadan is much more about purifying the soul, focusing attention on God and about self discipline and sacrifice rather than focusing on food and drink. After sunset the fast is broken by taking a few sips of water and a few dates during Iftar or the evening meal. Suhoor is the meal served before sunrise. This meal is usually hearty and healthy meal to provide one with energy. Keeping in mind my intention of preparing healthy recipes (well, at least trying to) I decided not to make a rich fried snack but a healthy, replenishing, hydrating soup. Shorbat Adas is a Middle Eastern soup usually served at the beginning of Iftar. It is light on the stomach, provides the much needed liquid after the long fast and not spicy. This soup is so easy to make and very tasty. 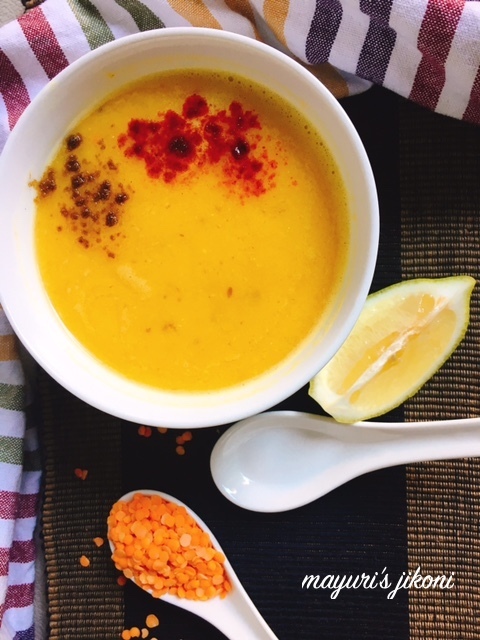 The ingredients used in the soup may vary from country to country but the basic ingredients red lentils, lemon, olive oil and cumin remains the same. Some add vegetables like onions, garlic, tomato, carrot, celery, squash etc and some don’t. I decided to add some vegetables. You may make it into a thick creamy soup or a little more light. I decided to make it not too thick or thin. I used water but you may use a stock. Shorbat in Arabic is soup and Adas is lentils. Here’s my contribution for the #FoodieMonday #Bloghop’s #97th theme which is Ramadan. Just a few more days before Eid. Ramadan Kareem to all my Muslim friends and followers. Wash the lentils 3-4 times in water. Soak the lentils in 2 cups of warm water for 30mins. As soon as the seeds begin to sizzle, add turmeric powder,onion, tomato, garlic and carrot. Sauce the vegetables for a minute or so. Add the lentils along with the water. Add the remaining 3 cups of water. Add salt and bring the mixture to a boil. Lower the heat and let it simmer till the lentils are cooked and disintegrated. Process the mixture using a hand blender or your blender jug. Add lemon juice,cumin powder and chilli powder. Serve hot soup with bread, pita bread, any flat bread or just on its own. Soaking the lentils reduces the cooking time. Add flat parsley or coriander if you like. This soup can be made without adding carrots or tomatoes. Healthy share Mayuri. Soup looks yummy. Will try after returning home. Mmmm Such a hearty soup, so tempting with its vibrant colors, love it! That looks fantastic..gonna try this soon. Thanks for this great recipe! That looks so delicious. Lentil soup is so nourishing, and this simple lightly spiced version looks fabulous. This soup looks so delicious! I love the beautiful colors. I can just imagine what it tastes like! Yum. That is such a lovely soup! The list is spices are among my favorite in the entire world! I love soups and this one is looking really tempting, lightly spiced soups are always welcome in my home. Healthy share dee! Love light and healthy soups. thanks Sujata.. try it, it is so delicious and easy to make. Thanks Bebs, let me know how it turns out. thanks, please do try it. It turns out really tasty. Thanks Elaine, try it as its so healthy and easy to make. Thanks Shobha, let me know how it turns out. Thanks Vidya. Try it am sure you'll like it. Thanks Shazia, the colour is from both the lentil and turmeric.